Today’s dish is something very unique and extremely crunchy! Don’t even try to eat it in the library! Have you ever wanted to just wrap uneaten pizza in the napkin and take it home without disturbing bags or even worse – pizza box in a bag? Now it’s your chance! We threw away everything unnecessary from the regular meat pizza and turned it into mini pocket pizzas with filling from both sides, say “no more” to the empty side of pizza! We chopped this beautiful chunk of fresh juicy beef neck into real mince using the best tool for it – knives! Mixed it with chopped organic tomato and onion loaded with flavorful Almazan special spice mix and hot garlic chili paste. Already mouthwatering, right? And for the whole firework we finish it off with few slices of chili pepper and thin homemade yogurt….. Like a carnival in Riode Janeiro. BONUS: As a bonus we will show you how to get rid of the rust from carbon steel knives. Chop 600g of beef neck into mince, chop tomato and onion, mix those with meat. Add 1 heaped tsp. of the spice mix, 1 heaped tsp. of garlic chili paste, salt to taste and handful of chopped basil. Mix and knead everything well! Slice homebaked bread. Coat each side of each slice with mince. Bake for 6-8 min. do not forget to flip! Finish it off with few chili peppers and homemade yogurt. Your cookings are really great. I do follow your youtube episodes and tried them too. 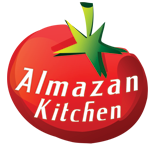 Could you please send the recipe of your Almazan special mix? Hello, love your channel. If I may ask, what’s the Almazan special mix? I’m very curious. Thank you for following our channel!